The answer is a mystery. What I recall is that I was deeply depressed during the winter months. Each morning before work, I crawled out of bed and went to the kitchen to fix breakfast. I made my way to the front room to pray, but wept instead. I provided counseling to others and tried my best to be of service. I slept on the office couch during the times when folks cancelled, praying to God for help, for strength, for anything that would help me find solace and hope during those lonely moments. Sitting in my work office one day in February, I stared outside at the school playground and admired the children frolicking on the brown grass that was dormant from winter’s touch. I remembered the lessons I teach my clients, and started going on afternoon hikes at work. I moved my body through the crisp winter air and on the cold earth, focusing on slate grey skies, the deep hue of the evergreen shrubs that line much of the city streets, and the skittering birds that flew overhead while I marched on. Strangely, the sadness lingered. It did not lift when the seasons changed from cold winter to vibrant spring and to sultry summer. I thought surely it would as I planted colorful flowers in my garden and fragrant herbs in huge pots with little red tomatoes and bright green ferns as borders. But it stayed with me in the dark when I could not sleep, when fearful thoughts about the future wrapped their shiny talons around my heart and soul. It slipped into conversations and whispered lies to me around others, urging me to run away, to isolate instead. At a party that summer, I reclined on a deck chair and chatted with a friend. I heard the lies again as I watched children splash in the pool and others enjoy themselves. A new narrative told me I didn’t belong with my new friends at their pretty home with their beautiful children in tow. Their beautiful children. I heard the word children echo in my mind, reverberating against the darkness of my heart. And that’s when I realized the origin of my grief: I mourned the loss of carrying children. That was the core of depression’s message last year, the shame that threatened to drag me down to the mire. I have a health condition that prevents me from having biological children, a significant back injury I sustained in the spring of 2014. What kind of woman am I if I will never bear a child? I didn’t know the answer then because my longing for a child was so strong that it eclipsed the knowing, at least at that moment. I called a dear friend in late winter and told her about my condition and lingering sadness. She advised me to get out of my office and sit outside, let the sun warm my body and spirits. She urged me to allow the desire for children to sit in my heart, to enjoy it without having to find answers just yet. I did as she said and took it one step further: I talked to my longing, letting her know I saw her, that she was worthy to come forth, and that my worth as a woman does not come from bearing children but from being a child of God first. It was hard to accept, I’ll admit. It took some time to hold together the longing to have children with the grief of losing the physical ability to bear children. I often tell my counseling clients that grief is a strange beast, because the only way to get through the difficult emotions is to allow ourselves to feel them. We must articulate the emotions through art, movement or writing, and welcome them in. I was having to take my own advice, it seemed. At the end of the year, I always like to sit and pray and choose a word to focus on for the upcoming year. It gives me a chance to set my intention for the year. But this year I struggled to choose a word. I thought “enough” might be a great word since it dovetailed nicely with the knowledge that I am more than enough, even without having children for now, even if I never raise a child. But this time the word chose me. At lunch with my best friend at the beginning of the new year, she handed me a handmade bracelet decorated with the word “beloved.” She knows about my struggles, and said she knew this was the word for me this year. I beamed with joy and felt utterly seen. What a gift it is to have girlfriends who know you and see your struggles, take them on and work with you to transform them into beauty. I proudly wore the bracelet all day long, a visible reminder of who I truly am. The bracelet rests on my entryway table, something I carry along with the grief of an aging body and my desire to mother a child. If I do not mother anyone else this year or next, I will mother myself. This is the lesson I am learning: that my identity as “beloved” resides in the very core of my being, not in anything I can produce. I mother myself well when I discard old narratives about what it means to be a woman and let myself carry and embrace who I truly am. I am a beautiful and beloved daughter of God, deeply known and treasured for who and what I am. Now and always. If I do not mother anyone else this year or next, I will mother myself. 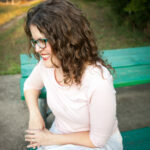 Jenn Zatopek is a recovering perfectionist, writer, and licensed therapist from Texas. She loves deep conversations over small talk any day of the week and the mess of a grace-filled existence. She loves traveling to the mountains, swimming in the ocean, Canadian mystery novels, hot tea, and finding beauty in the everyday moments of life. Jenn loves meeting others and blogs about the intersection of faith, spirituality, travel, work, and relationships at www.theholyabsurd.com.